Location: Sindh Province, Indus River, Pakistan. 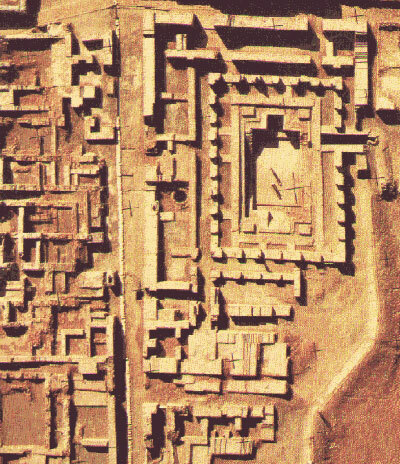 Grid Reference: 27°19' N, 68°07' E.
Mohenjo Daro: (Indus Valley City). Mohenjo-Daro was a city located in the south of Modern Pakistan in the Sindh Province, on the right bank of the Indus River. It was built between four and five thousand years ago, and lasted until 3,700 BP. It was part of the Harrapan Civilization, and at its peak, the city had at least 35,000 residents. This was a sophisticated society with a wide-ranging diet that consisted of meat from both wild and domesticated animals and a variety of cultivated wheat, barley, peas and lentils – a huge step forward in human progression from the nomadic hunter-gatherers. Mohenjo Daro was one of the largest centres of the Indus Valley Civilisation, experiencing the transition from Stone-age to Bronze-age. Mohenjo Daro: (Mound of the Dead). Mohenjo Daro is probably the best known of the Indus Valley civilisation cities. Similar in style and date to Harappa in north Pakistan, it was built almost entirely of kiln-fired bricks between 2,500 and 2,100 BC (12). Originally square in outline, the City was laid out along the lines of a grid. Twelve main streets divided it, of which eleven blocks were residential with the twelfth section being dominated by the Citadel. The city had a sophisticated sewage system with regular manhole covers. Public latrines for every block and sewers large enough to walk in. (1) House drains, which were enclosed systems, were made of clay pipes and were connected to the sewers by open brick gutters. Article: PAKISTAN SITE - OLDER THAN MOHENJO DARO? An archaeological site dating back about 5,500 years and believed to be older than Mohenjo daro has been found in Pakistan's southern Sindh province. A team of 22 archaeologists found some semi-precious and precious stones and utensils made of clay, copper and other metals during an excavation at the site in Lakhian Jo Daro in Sukkur district. "At present, we can say that it (the site) is older than Mohen jodaro," Ghulam Mustafa Shar, the director of the Lakhian Jo Daro project said. The find is believed to date back to the Kot Diji era, experts said. Shar said the remains of a 'faience' or tin-glazed pottery factory had been found at the site. It is believed to be of the era of mirror factories in Italy that date back to some 9,000 years. A painting has also been found at the site and the discovery of more such items could establish the site as 9,000 years old, like the remains found at Mehargarh in Balochistan and Jericho in Palestine, Shar said. “Its plan is simple: in the centre, an open quadrangle with verandahs on its four sides, and at the back of three of the verandahs various galleries and rooms; on the south, a long gallery with a small chamber in each corner; on the east, a single range of small chambers, including one with a well; on the north a group of several halls and fair-sized room. In the midst of the open quadrangle is a large swimming-bath, some 39 feet long by 23 feet broad and sunk about 8 feet below the paving of the court, with a flight of steps at either end, and at the foot of each a low platform for the convenience of bathers, who might otherwise have found the water too deep. The bath was filled from the well…, and the waste water was carried off through a covered drain…The Great Bath had a least one upper storey as evidenced by a stairway. A large amount of timber, possibly richly carved, must have gone to the building of the upper storey, judging from the quantities of charcoal and ashes found in the course of excavation". The outer walls of the Great Bath measure between 7 and 8 feet in thickness and were lined with bitumen. It is possible that this 'Bath' was a common purification pool. It was the largest of the four ancient civilizations of Egypt, Mesopotamia, India and China. 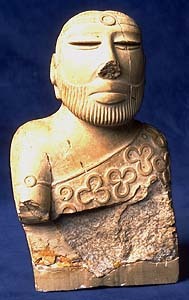 However, of all these civilizations the least is known about the Indus Valley people. This is because the Indus script has not yet been deciphered. There are many remnants of the script on pottery vessels, seals, and amulets, but without a "Rosetta Stone" linguists and archaeologists have been unable to decipher it. 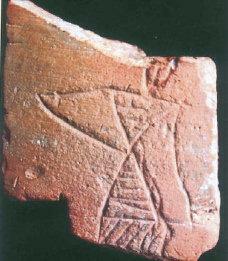 Stone ‘seals’ with intricate carving were found (see below), that correspond to similar Iraqi seals from the mid-third millennium BC. (1). Some of the seals found were almost exact the same as those found in ancient Sumerian sites. 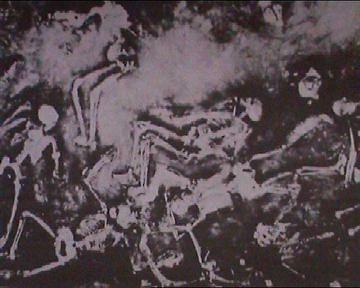 Note: Appearance of Sumerian 'Gilgamesh' figure bottom left. Ancient Mesopotamian texts speak of trading with at least two seafaring civilizations - Makkan and Meluha - in the neighbourhood of India in the third millennium B.C. This trade was conducted with real financial sophistication in amounts that could involve tons of copper. The Mesopotamians speak of Meluha as an aquatic culture, where water and bathing played a central role. A number of Indus Valley objects have been found buried with Mesopotamians. 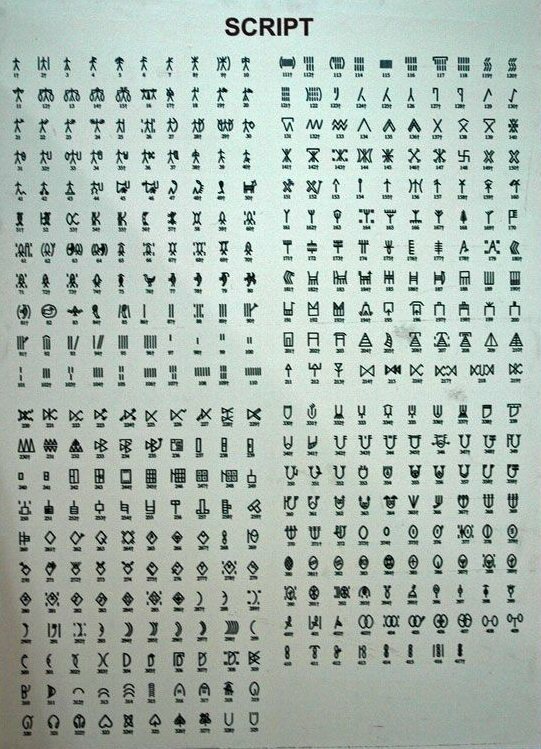 The ancient script of the Indus valley people has been found in another location, Easter Island; which is exactly diametrically opposed to Mohenjo daro. This curious coincidence has yet to be properly explained. The Indus Valley Culture was extant thousands of years before the Easter Island culture began, yet the similarity between the two scripts is uncanny. A team led by a University of Washington researcher has used computers to extract patterns in ancient Indus symbols. The study, published this week in the Proceedings of the National Academy of Sciences, shows distinct patterns in the symbols' placement in sequences and creates a statistical model for the unknown language. 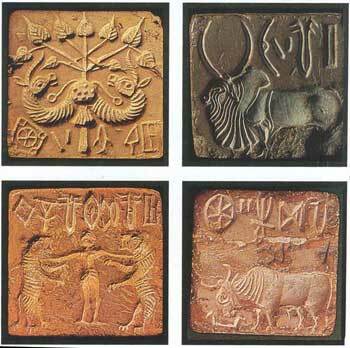 Despite dozens of attempts, nobody has yet deciphered the Indus script. 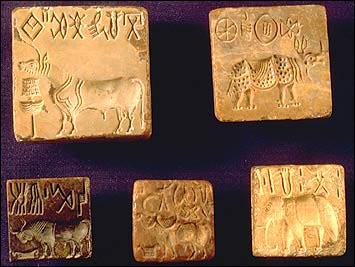 The symbols are found on tiny seals, tablets and amulets, left by people inhabiting the Indus Valley from about 2600 to 1900 B.C. Each artefact is inscribed with a sequence that is typically five to six symbols long. Some people have questioned whether the symbols represent a language at all, or are merely pictograms of political or religious icons. The new study looks for mathematical patterns in the sequence of symbols. Calculations show that the order of symbols is meaningful; taking one symbol from a sequence found on an artefact and changing its position produces a new sequence that has a much lower probability of belonging to the hypothetical language. The authors said the presence of such distinct rules for sequencing symbols provides further support for the group's previous findings, reported earlier this year in the journal Science, that the unknown script might represent a language. "These results give us confidence that there is a clear underlying logic in Indus writing," Vahia said. Seals with sequences of Indus symbols have been found as far away as West Asia, in the region historically known as Mesopotamia and site of modern-day Iraq. The statistical results showed that the West-Asian sequences are ordered differently from sequences on artefacts found in the Indus valley. This supports earlier theories that the script may have been used by Indus traders in West Asia to represent different information compared to the Indus region. The Dancing Girl. (Bronze Figurine): 2,500 BC. Mohenjo Daro. 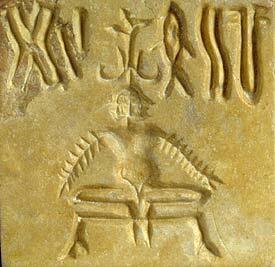 The famous "Dancing girl" found in Mohenjo-daro is an artifact that is some 4,500 years old. 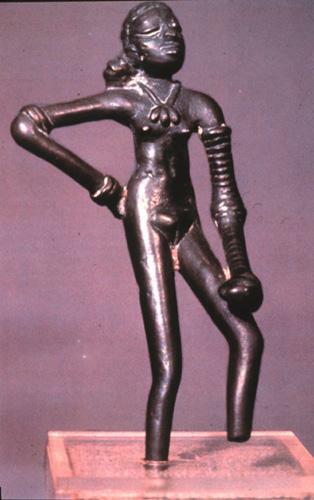 The 10.8 cm long bronze statue of the dancing girl was found in 1926 from a house in Mohenjo-daro. 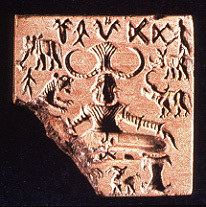 In a rare discovery, the Archaeological Survey of India has found at Bhirrana, another Harappan site in Fatehabad district in Haryana, a red potsherd with an engraving that resembles the ‘Dancing Girl,’ the iconic bronze figurine of Mohenjo daro. While the bronze was discovered in the early 1920s, the potsherd with the engraving was discovered during excavations by the ASI in 2004-05. 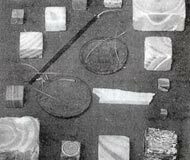 Several Copper and Bronze objects have been discovered at Mohenjo Daro, they were first cast and then hammered to required shape. 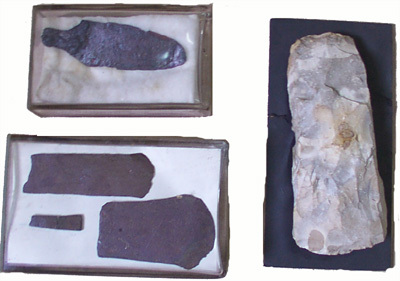 Stone axes and flake-knives have also been found in several houses of Mohenjo-Daro illustrating that the city witnessed the transition from 'stone-age' to 'Bronze-age'. The statue of the so called priest-king has a circular space on the forehead. 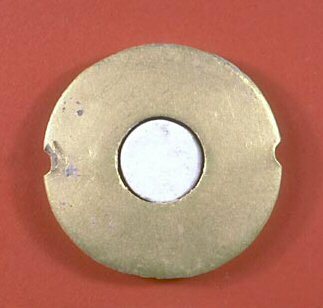 A small gold disc, unearthed in the same location fits perfectly into this space and is suggestive of a possible forerunner to the 'Third-eye' or 'Bindi' of Hindu myth. Shiva had a third eye called the 'burning eye'. The Myth of a Nuclear Explosion. 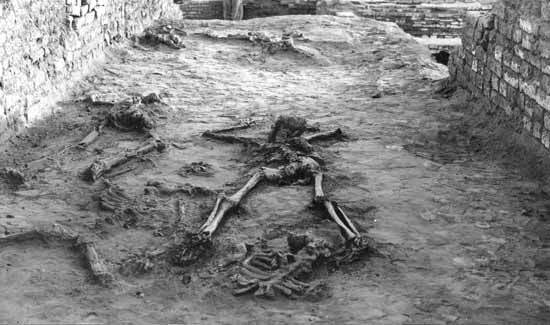 For several years, it was insinuated that a devastating event had occurred at Mohenjo daro, killing everyone on the spot. The 'War of the Gods' in the Mahabharata was said to be historical narrative of a nuclear explosion. Although archaeology on the site only revealed 37 bodies in ten years digging, and at different levels of occupation (3), and there are no reports to substantiate suggestions of a higher than normal level of background radiation, the myth still lingers on. The last levels of occupation show skeletons with sword-cuts, holding hands and lying in the streets They most certainly record a tragic end to what was once one of the capital cities of a great civilisation. ISLAMABAD: Authorities appear to be dragging their feet in preventing the pilferage of precious artefacts from the Mohenjodaro site, according to an official document. A revised master plan for conservation and promotion of cultural tourism at the Mohenjodaro site awaits the federal government’s nod at a time when President Asif Zardari and PPP senior vice-chairman and Prime Minister Yousuf Raza Gilani are at the helm of affairs. But the Mohenjodaro site, falling under the federal government’s jurisdiction, is regrettably facing a double whammy: non-stop pillage of antiques and severe seepage and damage, reveals the document made available to the news. Major features of the revised master plan are archaeological conservation, acquisition of land, further excavation and conservation, landscaping and environment development, a tourism monument plan and an interpretation system. 6). Kenoyer, Jonathan. 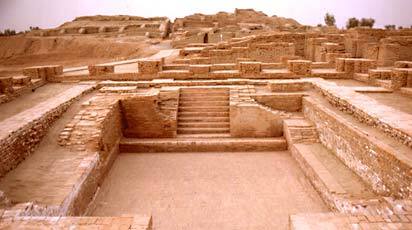 (July 2003) Uncovering the keys to lost Indus cities. Scientific American. pg 71. 8). Feurstein, George, Kak, Subash, Frawley, David. (2001) In Search of the Cradle of Civilization. Wheaton, Illinois. Quest Books. 83. 17). Sir John Marshall: Mohenjo-Daro and the Indus Civilization: Being an Official Account of Archaeological Excavations at Mohenjo-Daro Carried Out by the Government of India between the Years 1922 and 1927. Asian Educational Services, New Delhi, p. 2.